Though more often than not it is COLD in early spring, for the Japanese it has always been the OCCASIONAL warm breeze, the stirring of certain plants and animals and the blooming of the plum blossoms (especially on snow covered branches)- that is to say the little CHANGES and HINTS which gave hope and expectation of things to come- that were what early spring was appreciated for. 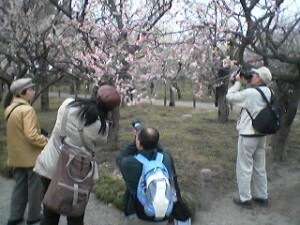 The blossoms of the plum tree (ume no ki), which has been bred into such numerous varieties since being brought to Japan more than 1000 years ago by returnees of missions to various Chinese dynastic courts*, rival those of Japan’s national flower, the cherry blossoms (sakura no hana) in terms of endearment in the hearts of the Japanese people. 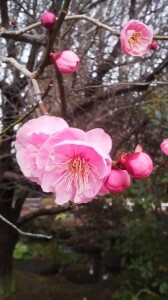 In fact, in the early Showa Period, there was a heated debate over which of the two WOULD become the national flower. The plum’s strong points were not only that it was beautiful and highly fragrant and the first major blossom of the new year- and thus a symbol of spring’s coming (often praised by the greatest of Japan`s classical poets), but it was also a feature of the DAILY JAPANESE DIET- in the form of UME BOSHI, or salted plums, as well as a popular ingredient for liquor, juice and various sweets. 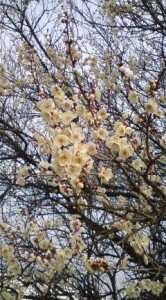 It was probably the fact that plum blossoms were already the national flower of China (which they still are in Taiwan), and had been introduced to Japan from there, that the UME lost out in the battle for National Flower. Of course, there is also the matter of the more delicate cherry blossoms being more representative of the quintessential Japanese concept-MUJO (無常), the fleeting nature of all things. The fact that cherry blossoms fall away while they are in full bloom- without whithering first- also made them perfrect symbols to be used by yhe army and navy to glorify young men in their primes dying in battle. Despite the fact that they had been brought over from the continent, the first western scientists to encounter the plum trees, including Philip Von Sebold, mistook them as being native to Japan. This could also be because, though a popular motif in Chinese art, there is no special tradition of viewing their flowers nor is there the custom of regularly eating their fruit. How did the ume no hana come to have such a connection to studies and the passing of tests? 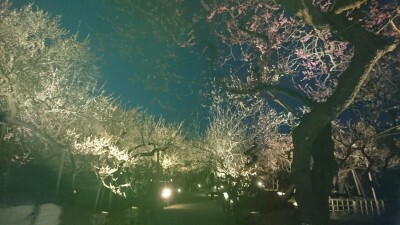 Well, the answer is simple: the plum tree was a favorite of SUGAWARA NO MICHIZANE, the great Heian Period poet, scholar and calligrapher who was unjustly expelled from the capital, died in exile, and was later enshrined as the GOD TENJIN, the patron god of scholars, poets, calligraphers and students. 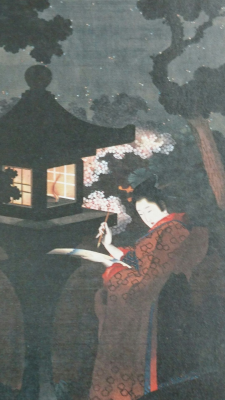 According to legend, when Michizane was leaving the capital on the road to exile in distant Dazaifu, Kyushu, it was only his plum tree that Michizane bade farewell with this, the most famous of all his poems. Legend then says that the tree came flying all the way to Kyushu to give the forlorn aristocrat solace to the end of his days (which was not very far off). 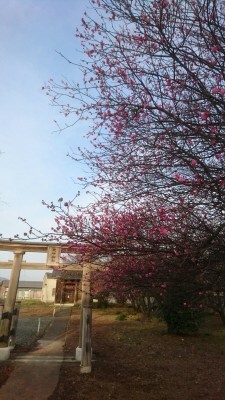 There are almost always plum trees, sometimes hundreds, at shrines dedicated to Michizane, or TENJIN, as he is called in deified form. 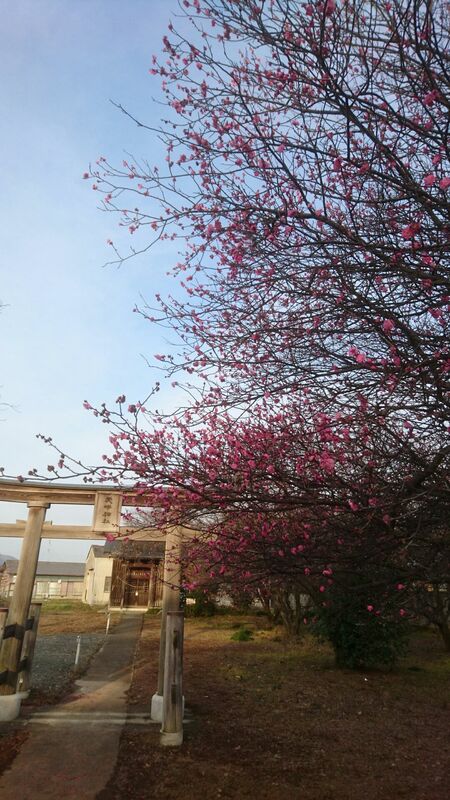 In this season, millions of supplicants visit these shrines to pray for exam success, and appropriately the plum blossoms are opening, filling the sacred precincts with the fragrance of HOPE. Luckily for those of us who live in Ibaraki, Mito, our prefectural capital is the home to one of the most famous places for enjoying plum blossoms, KAIRAKUEN. 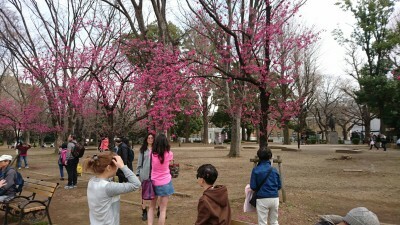 The ume festival there will run through the end of this month. It is because they provide the medicinally important and tasty plums for umeboshi (salted plums) which have become a standard part of every boxed lunch, that the frugal and practical minded Tokugawa Nariaki, the founder of the Kairakuen Garden planted so many of the trees. They were also symbolically important for the Mito Tokugawa Family which prided itself on its scholarship. 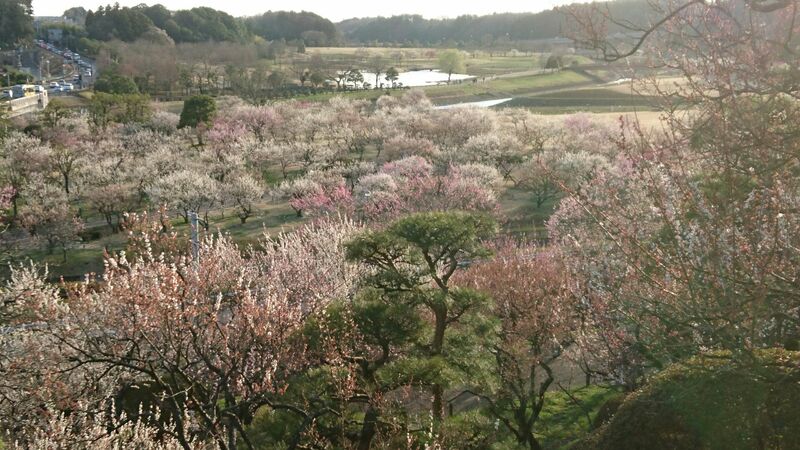 You can enjoy the fruit of his efforts by getting on the Joban line this week, heading north just one stop past Mito station, and enjoying the blossoms, the spectacle and maybe a little plum wine (ume shu, 梅酒). Entrance is FREE. 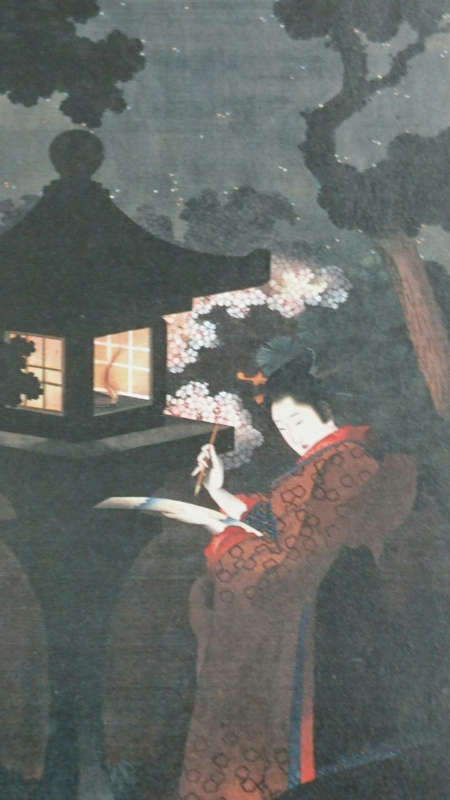 Enjoying plum blossoms at night – you do not need illumination at all – in fact there is a Haiku Kigo (seasonal word) HARU NO YAMI (春の闇) which implies a darkness filled with a fragrance of plum blossoms! Closer to home is the Plum Festival at Mt Tsukuba. 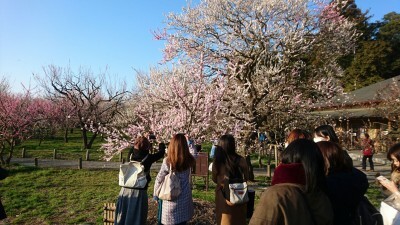 But even if you dont have the chance ( or the will) to make it to these major events, you can enjoy blooming plum trees during a stroll in just about any neighborhood in Tsukuba. * Recent archeological evidence shows that UME tree were brought over from the continent earlier than previously believed- during the Yayoi period, at the same time as rice cultivation was introduced from Asia. 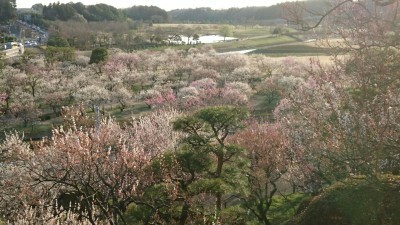 This week you have a chance to see the 3000 plum trees of the famed Kairakuen Garden in Mito in full bloom. On the weekend, a temporary train station will be in use bringing you direct service to the gardens entrance. 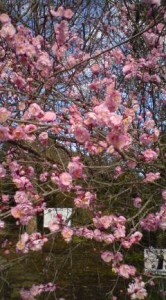 The garden offers the chance to see varieties of plum trees you never thought existed. The tora-no-o, which looks like a tigers tail, the darly pink kounshomu, the nearly translucent tsukikage, etc. 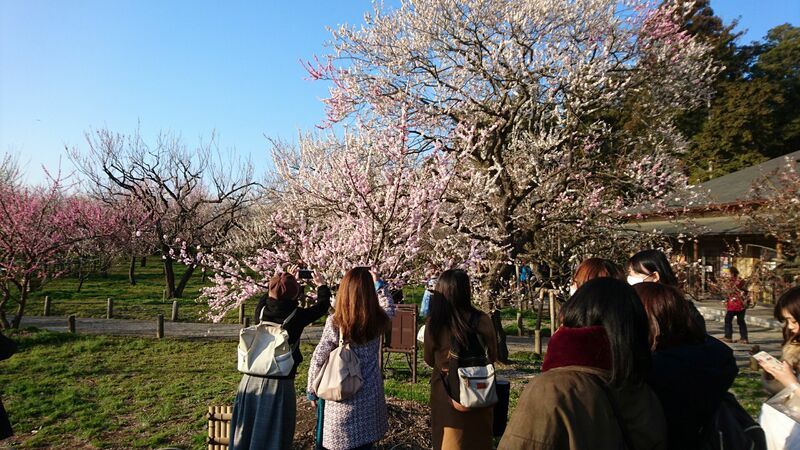 Komatsu Otome`s Blossoms in Ueno Park Have Us Shivering with Antici……Pation – for the Cherry blossom festival (hanami) there!